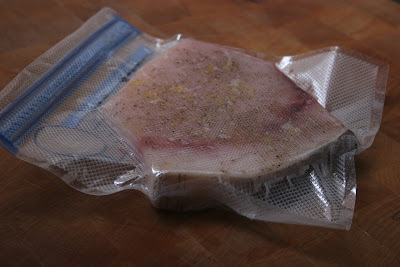 I think that most fish cooked sous-vide is a little over rated. There is something about the texture that just doesn't work for me. There are a couple of notable exceptions: Swordfish, Monkfish and Skate. With both Swordfish and Monkfish, you can get thick cuts of dense fish that remain incredibly moist, and you can achieve some amazing textures. Alas, I didn't take any other pictures. Swordfish (thicker the cut the better), lemon zest, salt and pepper. This was tossed into a 127F bath. Lemon zest is an amazing ingredient when used in sous vide cooking. It results in a very powerful and clear lemony flavor. After the bath, I seared it in a cast iron pan. The only warning I have with fish in sous vide, besides the texture/consistency issues, is that it will turn to mush if you let it cook too long. The great thing about this was I used a minimal amount of fat (just the oil in the pan for searing). Pretty low in fat, not many calories, omega-3s, dense and protein-y... or... you know, filling.